So, everyone, the final Ending Beginnings prequel novella is finally out and ready for you to devour. It's been a bitter sweet process, trying to write these and finish book 3 all at once. However, it's been really fun and enlightening being able to delve deeper into our characters, and I think that will really show as LF and I move forward with the series. Without further ado, here are the first three chapters for your perusal (purchase links are also included). 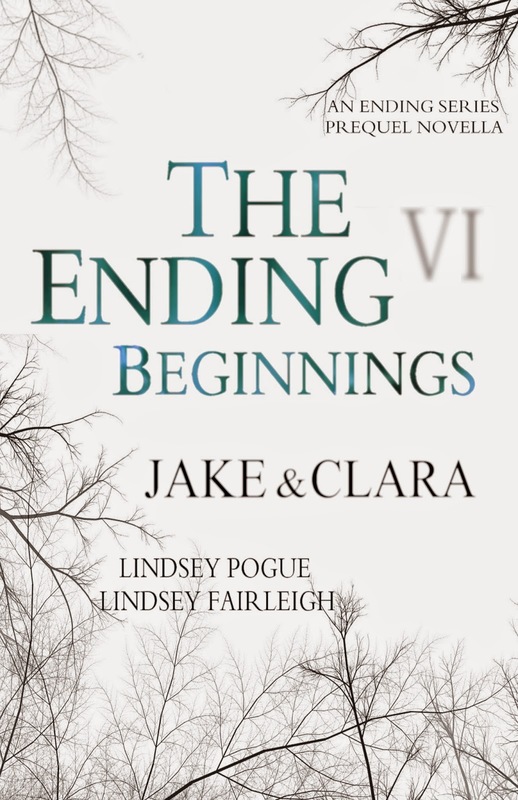 The final of six The Ending Series prequel novellas. The virus changed everything. This is how it began. After his sister’s death, Jake is determined to seek revenge against his best-friend-turned-enemy. However, after meeting Clara, who's as convincing as she is unnerving, his plans change completely. Clara has all but given up on finding her Prince Charming, but the moment Jake walks into the hospital, her future becomes much brighter, despite the world-ravaging virus that's turned everything upside down. But traveling across the country together proves more difficult than either of them expects, and just when they both think the world couldn't get any worse, it does. Jake sat on an overstuffed couch in the hospital’s rec room, the stark furniture and barren walls brightened by the muted, flashing television. The President’s address looped on the radio at the nurses’ station behind him, and the more the words sank in, the more his mind reeled. A global pandemic? Start over? Build anew? Was that even possible? Amidst his chaotic mind chatter, Jake wondered what the hell he was going to do next. Rising from the couch, he took three steps toward one of the barred windows across from him, braced his hands against the wall on either side, and let out a long exhale. He stared out at the crashed Cadillac and the few buildings that were visible through the trees across the road. Despite the fact that the city was enshrouded in midnight, it was so changed. It was desolate, like living in the country, but in a more unnatural way. There was no one catching a late night cab…there was no traffic. Street lamps illuminated the haphazardly parked cars on the snow-covered pavement, and a lone, scraggly terrier trotted down the sidewalk, a leash dragging in the snow behind him. The dog stopped and sniffed around the back of the Cadillac, no doubt searching for the remnants of the chips Kyle had left behind, before trotting out of sight. Choked sobs came from the cafeteria down the hall, breaking Jake’s concentration. The nurse, Roberta, hadn’t been able to calm Kyle down since the kid realized his father was dead, and it was beginning to grate on Jake’s nerves. As much as he thought he should care about the situation he was in—the disease, the billions dead, the pandemonium—he couldn’t, not really. The memory of Becca, struggling as she took her final breath, was too fresh in his mind, too raw. She was gone; Gabe took her away from him. Jake’s hands clenched into fists. He needed to stay focused. He needed to get to Peterson Air Force Base. He needed to find Gabe…to hurt Gabe. Emotions boiling, Jake let his hate and anger fuel him into action. He let out a resolute breath and pushed away from the window. But as suddenly as Jake turned around, he stopped. Clara, the blonde-haired woman whose blue eyes were too assessing, stood in front of him. Her head was tilted, her lips pursed, and her gaze flicked over his body. “Are you alright?” she asked, her voice light and curious. Giving her a curt nod, Jake brushed past her with the intention of heading toward the cafeteria. Clara reached out to him, her hand lightly clasping his biceps. Body tensing under her touch, Jake froze, looking down at her pale, delicate hand, then into her penetrating eyes. “It was nice that you tried to help that man,” she said, and a small smile pulled at her lips. Nodding, he started to take another step. “No?” Clara’s soft voice turned sharp, and she walked to the window Jake had been staring out of only moments before. She was scared, he realized. He should be scared. “You’ll be alright here,” he said, his voice carrying a weak attempt at comfort. Clara muttered something he couldn’t hear. After a few impatient steps, Clara was directly in front of him. “Take me with you, please?” Her eyebrows lifted and drew together. “No,” he said. “That’s not going to happen.” He suddenly needed to get out of the room as soon as possible. “Please.” Like a blade, the word cut into him, threatening to sever his last shred of decency. “Please,” she whispered. Unable to resist, Jake turned around. Clara reached out to touch his arm again, and Jake flinched away. “I just need to grab a few things from my house,” Jake said, his voice gruff. As far as Clara could tell, he hadn’t spared her a single glance for over an hour, not since they’d climbed into his Jeep back in Colorado Springs and sped away from the hospital for good. Jake’s intense focus on the road ahead had only increased since leaving the eerily desolate, looted city behind. “No.” Jake sounded exhausted…or irritated…or both. His fingers tightened audibly around the steering wheel. Clara had been casting discrete glances in his direction since they’d been on the road, struggling to understand why his mood had darkened so much. They’d barely interacted at all, other than breathing the same air; there was nothing she could’ve done to upset him, at least nothing she could think of. “If you’re sorry about leaving that little boy behind with Roberta, don’t be. She’ll take good care of him.” Clara waited for some sort of reaction from Jake as he guided the Jeep off a frontage road and onto a dirt driveway that disappeared over a slight hill. Even with questions burning on her tongue, Clara decided it was best to let the topic go. The last thing she wanted to do was upset her Prince Charming before they’d even had the chance to get to know one another. At the rate they were going, it would be a long time before that happened, Clara thought bitterly. She wanted to express how grateful she was to him for bringing her along, but he clearly wasn’t in the most receptive mood. Back in the hospital, she’d seen his resolve, seen the way his eyes had burned with determination to do something reckless, and a desperate fear had ignited inside of her. Clara’d all but willed him to take pity on her, to abandon his suicide mission—whatever it was—and take her somewhere safe; she’d wanted to be with him with every fiber of her being. Although she knew what her own reasons were for wanting to leave with Jake—she was drawn to this alluring, protective man who she would willing spend the rest of her life with—she was clueless as to his reasons for changing his mind and allowing her to tag along. He didn’t seem to care that he’d found her in a psychiatric hospital; in fact, he hadn’t asked her a single question about it. To Clara, the fact that he’d been able to look past that proved there was something real and intense budding between them. They were meant to be together, and she just needed to hold on to that. Clara couldn’t dismiss her curiosity about his past though, especially if his day had been anything like hers, filled with crazy murderers locked behind metal doors and rooms housing cold, dead bodies. If that was the case, it was possible that the man sitting beside her wasn’t the man he’d been yesterday. After all, he’d wanted to go to Peterson Air Force Base so badly that he’d almost refused her plea. It was her obvious fear, she thought. Her fear mixed with their simmering attraction had finally won him over. Clara smiled inwardly. Her path had crossed with Jake’s for a reason, and now this tall, dark, and handsome stranger was taking her away from the hell she’d woken up in. It was like her own fairy tale was being written, jumping off the page, and becoming her reality, and despite her Prince Charming’s grim mood, her body was humming with giddiness. He’d proved just how noble he was when he tried to save Kyle’s father, even if he and Roberta had failed, and he’d saved her by bringing her with him, despite his initial reservations. No, Jake was the real thing, nothing like Andrew. Jake had proved he was a man of good conscience, that he was valiant, even. Joanna could have Andrew and his mind games. Silently, Clara chided herself for letting her thoughts run away from her. She knew it was stupid to believe in fairy tales, especially after how much trouble they’d gotten her into. But the little girl bottled up inside her still hoped, with all her might, that she could still have a shot at her own happy ending. From the corner of her eye, Clara studied Jake’s profile. Once again, his gaze was fixated intently on what lie beyond the windshield. Strength radiated off of him in nerve-settling waves, making her feel grounded and safe. Staring out the passenger side window, Clara watched as the tree-lined horizon brightened with the subtle glowing hue of sunrise. After a few more bumps in the road, the Jeep crawled to a stop before a small farm house, just behind what Clara assumed was a snow-blanketed sedan. Her gaze settled on the car. It looked like it hadn’t been moved in days. Whose was it? When Clara turned to ask Jake, his eyes were no longer empty, but illuminated by the dash lights; they were dark pools of pain. Clara’s stomach turned sour. She thought he was probably thirty or so, which meant he could have a wife…and children. Why had she not considered the possibility sooner? With a minimal sense of guilt, Clara hoped that maybe his family was dead, just like everyone else seemed to be. Taking a deep breath, she glanced around at her surroundings while Jake sat, unmoving, beside her. There were pine trees with snow-laden branches littering the land, and she could make out what appeared to be a separate, rundown garage behind the house; it was so old, it looked close to crumbling. No wonder Jake had seemed reticent to come home, Clara thought. The place was depressing. Although the house seemed charming enough, snuggled in among frozen trees and a few inches of snow, the porch light revealed pieces of pale paint curling off the wood siding, giving Clara the impression that Jake’s past wasn’t one of privilege, but one of hardship and struggle. A small smile curved her lips. It was just one more thing they had in common. Hot, stinking breaths heaved against the left side of her face, dissolving what few pleasant thoughts she had left. Dogs. Clara didn’t do dogs. Cooper was propped up on the center console, separating her and Jake. In silence, Jake stared at the house, completely oblivious as the Husky licked the side of her face, making her cringe, his wet nose cold against her skin. Letting out an annoyed breath, she turned away from him and tried to school her revulsion. “Are you going inside?” Clara asked, her tone harsher than she’d intended. She wasn’t sure why Jake had needed to come back to this place, but she hoped they wouldn’t stay long. The thought of being in a house—a home—he might’ve shared with another woman made her heart seize and her blood burn. As if her words had stirred Jake into action, he opened his door and climbed out of the Jeep before Clara could even remove her seatbelt. Cooper leapt into the driver seat, his bushy tail swatting her in the face before he, too, jumped out of the Jeep and began sniffing around in the snow. Reaching for her own door handle, Clara briefly met Jake’s eyes from where he stood at the open door. She stilled. The way he was staring at her—inscrutable emotions shadowing his eyes and tensing his expression—made her feel uncomfortable, almost unwanted. She bristled. After a frustratingly long moment, Jake nodded and shut the driver side door. Opening her own, Clara slid out of the passenger seat. As soon as her feet crunched down into the slushy snow and a frigid wind gusted past, she questioned her decision to leave the warm confines of the Jeep. Shivering, Clara yanked her scarf out of the backseat and wrapped herself up. She would learn nothing about Jake by waiting for him; she needed to go inside. Brushing stray bits of dog hair off her black peacoat with one hand, Clara shut the door with the other and followed after Jake. She found it increasingly difficult to walk in the snow. How long had it been since she’d gone outside? Two weeks? Three? Being locked in the hospital hadn’t afforded her much leisure time to be out and about. Jake, however, trudged through the snow easily, and his footsteps sounded heavy as he walked up onto the porch and stopped before the front door. He fumbled to fit his key into the lock. He was anxious, Clara realized. Something about this place unnerved him, and the realization made her uneasy, too. When Jake finally managed to push the door open, Cooper trotted inside. Jake, however, remained at the threshold, staring into the darkness as if it housed all his demons and childhood nightmares. Clara stood behind him, waiting, wondering. After a long, deep breath, Jake took a hesitant step into the house, Clara following tentatively behind. She knew why she was reluctant to be there, but was wary about why he was. “Is it safe?” she asked as she entered what appeared to be a haphazardly decorated living room washed in predawn light. There was a sharp, acrid scent in the air that she couldn’t place. Jake flicked on the light switch beside the door, and the overhead light flared to life, but he stood rigid, motionless. Cooper began sniffing around the blood and vomit. “Leave it, Coop,” Jake ordered, and the dog lifted his eyes to his master’s before whining and retreating down a dark hallway. Clara could only imagine the horrifying scene that had played out in this room, and she wanted nothing more than to comfort Jake…even if she was relieved to learn whoever else had lived there was apparently dead. “What happened?” she repeated, slowly reaching for Jake’s shoulder. Jake stepped out of her reach. “The bathroom’s in there,” he said, pointing to a closed door in the mouth of the hallway before following after Cooper. A light flicked on further down the hallway, and Clara could hear Jake rummaging around in what she assumed was probably his bedroom. Questions mounting and bitterness sprouting from his disregard for her concern, Clara shifted her stare back down to the blood on the floor and tried to let the fact that Jake had completely ignored her roll off her back. He was obviously still coping; she would give him time to come around. Clara listened to Jake moving around in the room down the hall while she studied the stark living room, devouring every single detail from the scant décor to furniture he’d no doubt bought at a garage sale or a thrift shop. Her gaze landed on a brown leather sectional that rested beneath a picture window, and a small, black purse—its contents sprawling out over the cushions—that was discarded there. Her eyes narrowed. Forcing herself to look away, Clara peered around at the walls, but there was nothing of interest on them aside from three patches of paint coloring the space between the front door and the large window—one mocha, one taupe, and one that was more of a sage. There weren’t any pictures to scrutinize, nor any artwork or sports memorabilia to indicate his hobbies and interests…or hers. In fact, the room was lacking any sort of feminine touch. Honing in on a desk situated against one of the walls across from her, Clara walked toward it; its old-fashioned charm and messiness stood out in the bachelor-esque space. Papers were strewn around on the desktop, a couple nursing textbooks were stacked to one side, and highlighters and pencils were scattered among the crumpled papers instead of inside the empty “Got Coffee?” mug that held only a single pen. The desk seemed to be the only part of the house that wasn’t meticulous—other than the blood and vomit she’d bypassed—and the only thing that had much character at all. Nursing books? Clara looked behind her at the purse on the couch, a Coach knockoff. Jake had definitely had a woman in his life, and based on all of the evidence, Clara guessed the desk was hers. Just as Clara looked down at the desk to study what was written on the papers—to look for a name or study the style of penmanship—Cooper scampered into the room, his nails clacking on the hardwood, making her jump. “Stupid mutt,” Clara muttered. He trotted into the kitchen, where a half-filled food bowl awaited him beside a round dining table. Wondering if they could leave the dog behind, Clara watched as Cooper scarfed down his food. She could hear the crunch of dried kibble and the sound of the bowl clanging against the wall with each impatient bite. She wasn’t sure why the dog’s mere presence annoyed her so much, but it did. She rolled her eyes. Hurrying back up the hallway, Jake entered the living room with two large duffel bags slung over his shoulders. “I need to grab a few more things from the garage.” His eyes darted to Clara’s, and she blushed, wondering if he could tell she’d been snooping. “I’ll be right back,” he said, dropping the bags near the front door. “There’s food in the cupboards.” He strode back into the hallway, opened a door that revealed a closet, and pulled out a canvas bag filled with more bags. “Fill these with food that won’t spoil,” he said, thrusting them at her. “There are more paper bags underneath the sink if you need them.” With that, he headed through the kitchen and out a side door, leaving Clara standing by the closet with the canvas bags balled up in her arms. She definitely wanted Jake to think she was useful, so she went to work, filling the bags with as much food as possible. After stocking them with granola bars, beef jerky, crackers, an almost empty bag of trail mix, a few plastic cups, bowls and spoons, cans of soup, and several bags of chips, Clara grabbed the few apples and oranges that were sitting in a fruit bowl on the counter, stuck them in one of the bags, and left everything on the kitchen table. With a sigh, she headed into the bathroom since she’d use it as her excuse for following him into the house to begin with. The moment she flicked on the bathroom light, Clara’s eyes found and lingered on the two toothbrushes in the holder. Closing and locking the bathroom door behind her, she tried not to feel angry or hurt, but it was impossible. She pictured Jake standing in the tight confines of the bathroom, his arm brushing against a woman’s as he stood beside her…washing up before they crawled in bed together for the night. Unbidden, an image of Joanna flashed through Clara’s mind, and she momentarily saw red. Realizing there was no possible way Joanna could’ve known Jake, that she could’ve been in any part of his life, Clara rolled her eyes at her own ridiculousness and went about her business. When she was finished, she washed her hands and face, then took a long, scrutinizing look at herself in the mirror. She stared into her shadowed, blue eyes, wondering if she might look like the woman from Jake’s past. She squinted and turned her head to the side, examining her jawline and pointed nose. She wondered what Jake thought of her appearance as she ran her fingers through her long, blonde hair. Was he helping her because she looked like the other woman? Clara realized that must be it. Why else would he keep his distance but be unable to let her go at the same time? It was all starting to make sense—the conflicted cast to Jake’s eyes, his hesitation. Clara wondered what else might be storming behind his intense gaze and quiet manner. With a sigh and a promise that, one day soon, she would ask Jake all of her questions, Clara flicked off the bathroom light and opened the door. The living room was silent, meaning Jake was still in the garage. Unable to resist the temptation, Clara took the opportunity to explore the rest of the house. She took a few quick steps further down the hall and stopped in the doorway to the room Jake had been banging around in earlier. Switching on the light, she noted that the bedroom was in disarray, but after all the drawer-slamming she’d heard, she wasn’t surprised. What did surprise her—and fill her with relief—was the lack of anything feminine in the small space. The dresser drawers were open, but all Clara saw were white t-shirts and a lot of neutral-colored long sleeve shirts. There were no pictures or jewelry boxes resting on top of the dresser, no photos hanging on the walls or decorative pillows on the bed, and the nightstand had only a glass of water and an alarm clock. There was nothing to make Clara think that Jake had shared this room with a woman. Turning off the light, she backtracked up the hall, stopping in a different doorway. With another flick of a switch, the room was illuminated, and Clara finally began to understand. Jake hadn’t lived with a spouse, but perhaps a roommate or sister. The bedroom was messy but feminine. A Queen bed was situated in one corner, a comforter balled up on top, and textbooks and tissues were scattered on the floor. Framed, scenic photographs, brightly colored painted canvases, and corkboards cluttered with scraps of paper and magazine cut outs decorated the walls around the room. “You shouldn’t be in here,” Jake said from behind her. Clara startled. “Is this your sister’s room?” she asked, standing in the center. She hadn’t even realized she’d entered it. She could tell he was trying to control his temper. The chill in his voice sounded more like hurt and sadness than anger, and she suddenly felt horrible for snooping—relieved the woman was his sister, but horrible, too. Hurrying after him, Clara entered the living room. “What’s in Indiana?” Clara asked, heaving another bag of food onto her other shoulder.